Our favourite beach near Nevez which has won again ! The blue flag eco-labelled beach awards have been announced for 2012.
made efforts with environmental protection as well as environmental education. Winning Beaches can fly the recognisable blue pendant flag during the summer. In France, 377 beaches and 87 marinas have gained an award this year, with 15 new winning beaches this year. New awards have gone to 8 beaches on the Atlantic Coast and one on the English Channel. Languedoc-Roussillon is still at the top of the labeled regions with 28 communities winning awards, followed by Cote d'Azur with 19, Pays de Loire with 15 and Basse-Normandie with 15. To gain a blue flag award, bathing waters should be found to be classified as "Excellent" when tested at least five times over the season. The results should be displayed on the beaches. 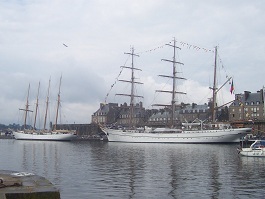 One of our favourite holiday destinations is Brittany in the North West of France. What does Brittany mean for us ? 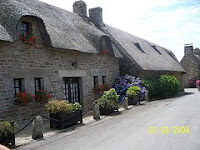 Crepes...galettes.....rugged beaches with beautiful white sand...coves and inlets, blue/green seas.... rocks and lighthouses and the ancient Breton language which you see in road signs and place names...granite cottages with colourful hydrangea bushes outside and fishing ports. The campsites we have visited offer all of these aspects of Brittany and by visiting them all over the years we have learned more about Breton culture and history. But if you are just looking for fun, relaxation and a great holiday by the sea they also offer all of those ! Let us take you on a quick tour ! The following campsites : Le Chatelet and Chateau le Galinee at St Cast or Chateaux des Ormes in the north of Brittany offer a great introduction to Brittany without being too far from some of the main ferry ports. You can visit the famous tourist attraction of Mont St Michel which is on the border with Normandy on the north coast. You can also visit the historic walled town of St Malo and learn of its history of pirates or corsaires and also of the history of how it was largely re-built after World War 2 - all very interesting. And you can enjoy a range of meals or takeaways in the various restaurants inside the walls. Then finish your day with a walk around the ramparts - a total distance of about 2 kms, although you can chose to walk just certain sections of it as there are plenty of exit and entrance points ! There is an interesting aquarium to visit at St Malo as well. 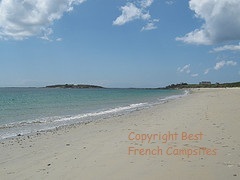 Other locations which make a great holiday include Carnac and its close neighbour Trinite Sur Mer. You will marvel at the thousands of standing stones that stretch for a couple of miles. What were they for ? Who put them there and how did they manage it ? You might find the answers while you are there ! There are a few interesting museums to visit in Carnac - one lovely one that was founded jointly by a French man and a Scotsman - the Museum of Prehistory (Musée de Préhistoire James Miln-Zacharie Le Rouzic) and also a more modern museum near the Standing Stones, Archaeoscope. Les Deux Fontaines campsite and Raguenes Plage campsite allow you to visit a quieter and possibly more scenic area of Brittany but with one of the most beautiful beaches, Tahiti Plage ! In that area we enjoyed visiting a lovely old village Kerascoet and also a botanic gardens. Benodet is a favourite for many and British people have been visiting this resort for about 100 years and there is a flavour of that when you are there. From here you can take a glass bottomed boat so you can view fish on a visit to the beautiful îles Glénan, an archipelago of islands twelve miles out to sea. Quimper was nice to visit and has a very historic cathedral, as has St Anne d'Auray. I would also recommend a visit to Pont Aven - a beatiful village sitting near the mouth of a river. This village is proclaimed as the Capital of Crepe making ! And we certainly enjoyed a delicious crepe in a restaurant which was previously an old mill sitting on the river. It has also been home to numerous artists over the years and you can visit quite a few art galleries and see if there are any paintings you would like to take home with you. There was art to suit all tastes, from modern to more traditional. And a final favourite in Pont Aven was a lovely glass blowing workshop and shop where you could watch the glass blowers at work and then buy some of their beautiful glassware. This year we are heading to the North West of Brittany, an area we first visited about 20 years ago. What are your favourite things to visit in Brittany ? Would you recommend a visit to this area or have you other areas of France you would suggest for a visit ? The famous French dictionary LaRousse provides French words but also typical examples of usage and you can even listen in to what is should sound like with "soundbites" of French speakers using the words. http://www.larousse.com/en/dictionaries/french-english There is also a version to download for your iphone via itunes !